This omelette recipe has potatoes, peppers and cheese - what could be better? 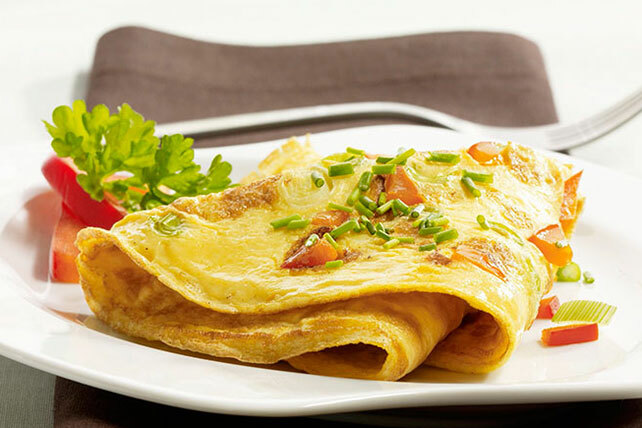 The perfect cheese omelette recipe for breakfast, lunch or dinner. Heat 1 Tbsp. oil in medium nonstick skillet on medium-high heat. Add potatoes and red pepper, cook 8 to 10 min. or until tender; transfer to bowl; set aside. Meanwhile in small bowl, whisk eggs and pepper. Heat remaining oil in skillet. Add egg mixture; cook 2 to 3 min. or until eggs are almost set, lifting edge with spatula and tilting skillet to allow uncooked portion to flow underneath. When egg mixture is set but top is still slightly moist, top with potato mixture and cheese. Slip spatula underneath omelette, tip skillet to loosen and gently fold omelette in half. Cook 1 to 2 min. Slide or flip onto serving plate; cut in half. Top with chopped green onion.